The US Secretary of State, Condoleezza Rice, has urged the world's powers to "redouble" their efforts to end the conflict in Sudan's Darfur region. Ms Rice said they could not "continue to sit by", after an international conference in Paris on the violence that has left some 200,000 people dead. Officials from the US, Europe and the Arab League discussed how to speed up the deployment of UN troops to Darfur. But Sudan said the talks were premature as it had already agreed to the force. The Sudanese Foreign Minister, Lam Akol, told the BBC that his government was in complete agreement with the composition of the peacekeeping force, its command, the nature of its operation and its mission. "We are ready to have the force deployed at any time," he told the BBC's Newshour programme. "The ball is actually in the court of the United Nations to expedite the operation." The Sudanese government was not invited to the talks, while the African Union boycotted the conference because it regarded the French initiative as a distraction from its own mediation efforts. Speaking after the gathering in France, Ms Rice said it had enabled the participating countries to "take stock" of the situation in Darfur and make sure they were doing everything they could. "The international community simply cannot continue to sit by," she told reporters. "We really must redouble our efforts." Ms Rice also warned the international community not to lose the momentum generated by the conference. "Those who have been around this for a while are going to work very hard against backtracking," she said. "We have had circumstances in which we have had agreements before and those agreements have not gone forward." Ms Rice's French counterpart, Bernard Kouchner, said the future was brighter for Darfur after the conference. "There is a little light at the end of the darkness," he said. Before the meeting, French President Nicolas Sarkozy called on the international community to be "firm" with Sudan if it refused to co-operate with efforts to end the conflict in Darfur. "Silence is killing," he said. Mr Sarkozy called for the swift deployment of UN peacekeepers in Darfur to support the current small African Union force presently operating there. He also pledged an additional 10m euros ($13.4m) to the AU force. "The lack of decision and the lack of action are unacceptable," he said. 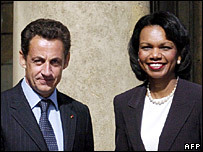 While Mr Sarkozy praised the Sudanese government for agreeing to the formation of a joint UN-AU peacekeeping force, he insisted it had to make more of an effort to bring peace to Darfur. "We must be firm toward belligerents who refuse to join the negotiating table," he said. On Sunday, the US and France said the world had failed the people of Darfur and that there was a need for decisive action. Sudan's government denies backing the Arab Janjaweed militias accused of the worst atrocities against Darfur's black African population. Khartoum says the scale of the problems has been exaggerated for political reasons.